Edward Hopper’s birthplace was Nyack, New York, which is on the western side of the Hudson River. For a brief time he took art lessons from the Correspondence School of Illustrating in New York City and later enrolled at the New York School of Art. The shift in art course led him to be under the tutelage of one of the leading Impressionist painters in America, William Merritt Chase and Robert Henri, who urged his students to paint every conditions around them with realism. He took trips to Paris and other parts of Europe and Spain, but was not very interested in Cubism and Fauvism that were developing at that time. Instead he became very attached to the works of Édouard Manet and Edgar Degas. The modern urban life and the compositional devices used by these two previous masters will have a great influence in Hopper’s works. Most of Hopper’s works revolved around ordinary people who were trying to make the best of everything. His settings, whether it was at a gas station or inside a diner or an automat were always on the edge of telling a story but they ultimately left it to the viewer to decide what the scenario meant. Hopper was meticulous in his work. He prepared several drawings preparatory to the actual painting where he worked out the light sources and directions, the facial expressions, and the relationships and positions of the figures in the painting. Hopper did not put in too many elements in his paintings, but he was a genius at achieving maximum impact with his skill in achieving a dramatic impact with his use of light and shadow. Hopper struggled to be recognized in the 1910s and joined several group exhibitions in New York, such as the Exhibition of Independent Artists in 1910 and the Armory Show in 1913. His first solo exhibition only happened in 1920, when he was already 37 years old. Primarily an oil painter, he also excelled as an etcher, which brought him more success. He maintained a studio in the neighborhood of Greenwich Village all his life, leaving only during the summer to spend time in New England. His wife, also a painter, was a very important figure in his life and career. Josephine Verstille Nivison, whom Hopper called Jo, became his main model for the female figures in his paintings, and it was she who provided assistance in arranging studio settings and props, as well as the encouragement to explore watercolor painting. His wife also kept meticulous records of his sales, his exhibitions and every painting he completed. 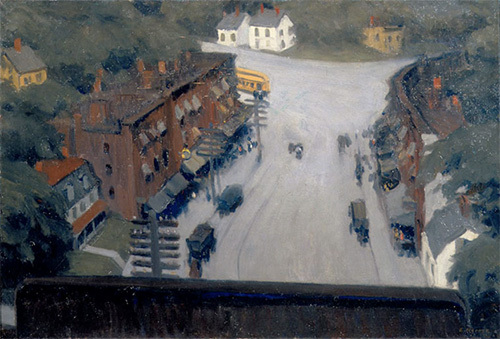 Hopper gained important recognition in 1933 after the retrospective exhibition at the Museum of Modern Art, showcasing his mature style wherein his works showed his signature sense of estrangement and silence, whether they were interior scenes, landscapes of New England or other urban settings. His paintings showed locations that were almost always devoid of human activity, showing the transitory nature of life back then. His scenes showed mystery and loneliness in deserted bridges, railroad tracks and gas stations. Sometimes a solitary figure or two were shown, although it was clear to see that no communication existed between figurative elements. He depicted people outside their homes, passing the time in places such as restaurants, hotel rooms or movie theaters. 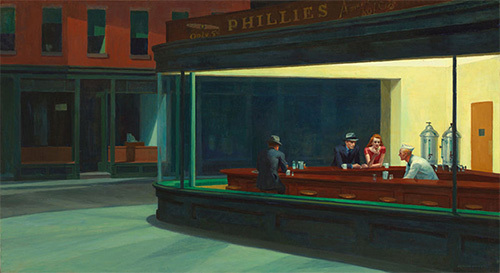 “Nighthawks” was Hopper’s most iconic painting, a work he finished in 1942 and which is now at the Art Institute of Chicago. It showed a diner, where only three customers and a waiter were the main figures. While the interior was brightly-lit, each of the figure in the painting showed their private and personal concerns and their weariness. There is a disconnection among the four individuals, which seemed to profoundly show the anxiety that went through the minds of people during the war. Although Hopper eventually lost favor when Abstract Expressionism started to gain dominance, he remained popular and even became very influential to a new group of realist artists in America even after his death.